Ethan Allen, Vermont’s beloved but elusive folk hero, died on February 12, 1789. The manner of his death was an enigma; some say he suffered a stroke crossing Lake Champlain as he was heading to his Winooski River homestead; others contend his death was caused by falling from his sleigh in a drunken stupor. We do know he died at the age of 52. Vermont’s founding father was actually born in Litchfield, Connecticut, on January 10, 1738. 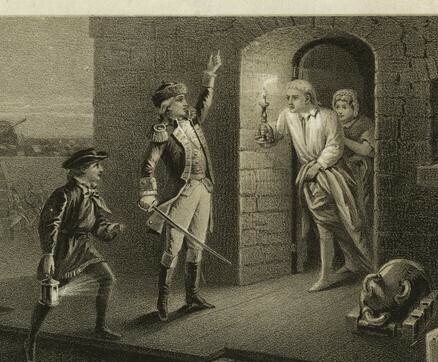 He was the leader of the Green Mountain boys during the Revolutionary War, and won acclaim by capturing Fort Ticonderoga assisted by Benedict Arnold, in May of 1775. When leading an invasion of Canada that September, Allen was taken prisoner and held captive until 1778. Upon his return, he was immediately given the brevet rank of Colonel in the Continental Army, and proclaimed the Major General of Vermont. When Allen was caught in negotiations with Britain to possibly rejoin the empire after Congress turned down Vermont’s bid for statehood, it stirred up a great deal of controversy. His apologists stated this was obviously a ruse to pressure Congress into granting Vermont statehood, while others believed he was clearly protecting his considerable land holdings. He wrote “Reason the Only Oracle of Man” with his friend Dr. Thomas Young (though some say he plagiarized his work), which was published in 1785. The work is highly critical of the Bible, and puts forth the idea of a deity in total harmony with nature, a controversial notion in 18th century New England. His reputation as free-thinking independent spirit was further solidified. His last few years were relatively tranquil, but there’s still the question of what caused his death in 1789. And many other questions to boot. As modern historians examine what is known definitively about Ethan Allen, it becomes apparent that the man is quite different than the myth. Unsurprisingly, his accomplishments have been exaggerated – for example, yes, he took Fort Ticonderoga, but his troops out-numbered the enemy’s four to one. He missed the bulk of the Revolutionary War as well as when Vermont declared its independence, as he was a prisoner of the British during that entire period. He never held any elected political office at any time. So why the veneration of a Revolutionary War bit player? Simply because Vermont needed a hero, and Ethan Allen had, if nothing else, gumption. During the 1830s, Vermont was in a serious economic slump. Many citizens were quite literally leaving for greener pastures, as Vermont could not match the agricultural productivity of states further west. Morale was low, and the populace needed to harken back to a time when Vermont was thriving, and large-than-life heroes were shaping its destiny. Vermonters needed to be proud of their past so they could have hope for their future. The crafting of the Ethan Allen legend began 45 years after his death when Professor Jared Sparks penned his biography, calling him a “leading Revolutionary figure.” Soon after, author Daniel P. Thompson wrote the novel “Green Mountain Boys”, playing up Allen’s historical exploits to the hilt and creating a storybook hero that all Vermont schoolchildren were familiar with for generations.